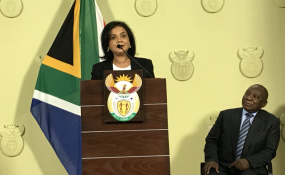 Cape Town — President Cyril Ramaphosa has named Advocate Shamila Batohi as the new National Director of Public Prosecutions (NDPP). Speaking on Batohi's appointment Ramaphosa said: "I am confident that Adv Batohi possesses all the attributes of a capable NDPP. Throughout her extensive and distinguished career, and in the course of the selection process, she has shown herself to be a fit and proper person." "At this moment in our history, as we address matters that South Africans are most concerned about – such as state capture, corruption and widespread crime – our country needs a National Prosecuting Authority that is above reproach in the performance of its mandate and that enjoys the confidence of the public." "The NDPP must ensure that the National Prosecuting Authority exercises its functions without fear, favour or prejudice and should not be beholden to any vested interests, whether in politics, in business or elsewhere." Batohi will start her term in February 2019 after her term at the International Criminal Court expires.